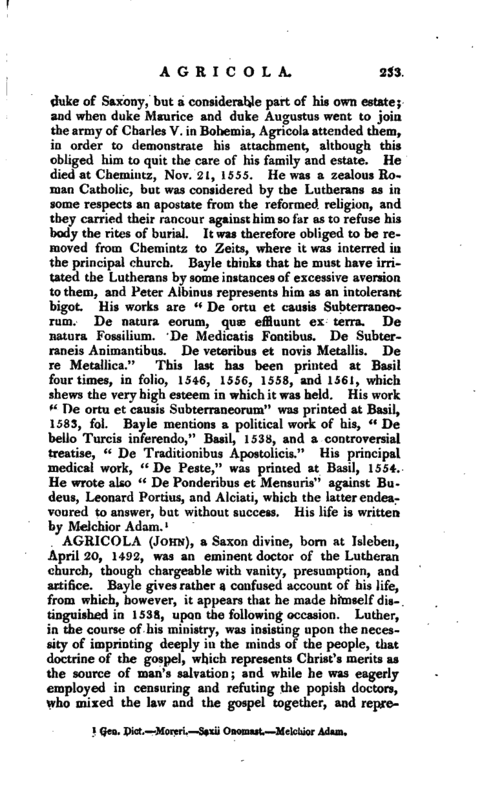 , a Saxon divine, born at Isleben, April 20, 1492, was an eminent doctor of the Lutheran church, though chargeable with vanity, presumption, and artifice. Bayle gives rather a confused account of his life, from which, however, it appears that he made himself distinguished in 1538, upon the following occasion. Luther, in the course of his ministry, was insisting upon the necessity of imprinting deeply in the minds of the people, that doctrine of the gospel, which represents Christ’s merits as the source of man’s salvation; and while he was eagerly employed in censuring and refuting the popish doctors, who mixed the law and the gospel together, and | represented eternal happiness as die-fruit of legal obedience, Agricola took an opportunity to declaim against the law, maintaining that it was neither fit to be proposed to the people as a rule of manners, nor -to be used in the church as a means of instruction; and that the gospel alone was to be inculcated and explained both in the churches and in the schools of learning. This was the foundation of the sect of Antinomians, who appeared in England during the usurpation of Cromwell, and carried their extravagant doctrines to a higher pitch than this Agricola. But the fortitude, vigilance, and credit of Luther suppressed the followers of Agricola for the present; and Agricola himself, intimidated by the opposition of so powerful an adversary, acknowledged and renounced his system. His recantation, however, does not seem to have been sincere, since we are told that, when his fears were dispelled by the death of Luther, he returned to his errors, and gained many proselytes. 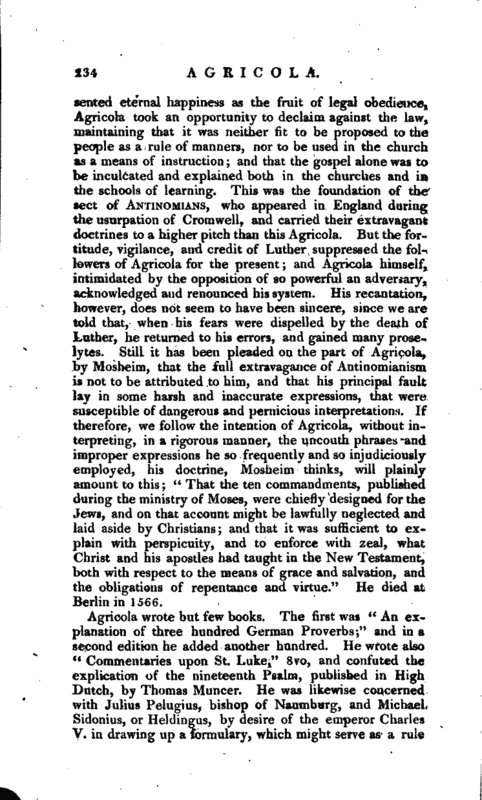 Still it has been pleaded on the part of Agricola, by Mosheim, that the full extravagance of Antinomianisra is not to be attributed to him, and that his principal fault lay in some harsh and inaccurate expressions, that were susceptible of dangerous and pernicious interpretations. 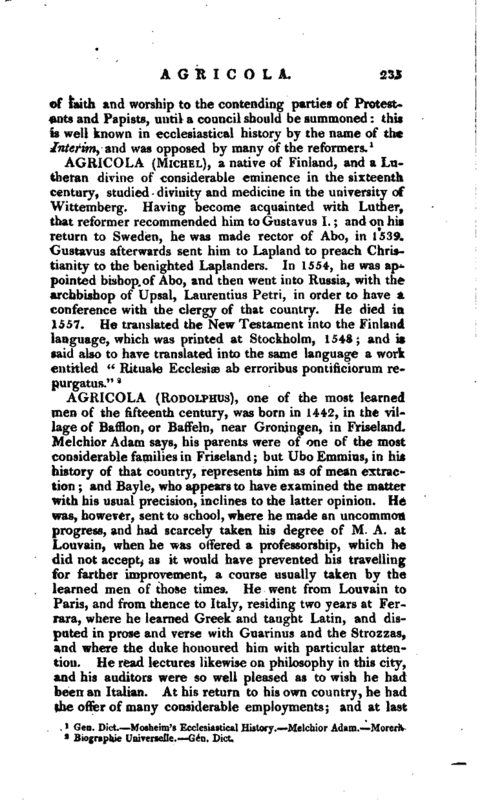 If therefore, we follow the intention of Agricola, without interpreting, in a rigorous manner, the uncouth phrases and improper expressions he so frequently and so injudiciously employed, his doctrine, Mosheim thinks, will plainly amount to this; “That the ten commandments, published during the ministry of Moses, were chiefly designed for the Jews, and on that account might be lawfully neglected and laid aside by Christians; and that it was sufficient to explain with perspicuity, and to enforce with zeal, what Christ and his apostles had taught in the New Testament, both with respect to the means of grace and salvation, and the obligations of repentance and virtue.” He died at Berlin in 1566. Gen. Dict. Mosheim’s Ecclesiastical History. —Melchior Adam.—Moreri.